Nothing is more frustrating than being asked to answer questions that are not relevant to you! What does your company have in common with AT&T, GE Healthcare, ISCS, Pella Corporation and Tyler Technologies? Just like these companies, your business needs to collect and present information! Most of the time, information is collected from customers, employees, vendors or partners through the use of a form and its data delivered to you using an appropriate document or portal. DocOrigin is an enterprise-class software solution that combines a professional graphical form designer with a powerful production engine capable of serving up documents and forms for the most demanding global companies. Whether you are designing forms to collect data on mobile devices or computers – or you need to generate millions of production documents in electronic or printed format – or labels for patient wristbands or manufacturing or shipping – DocOrigin provides the dynamic fillable form solution you need. 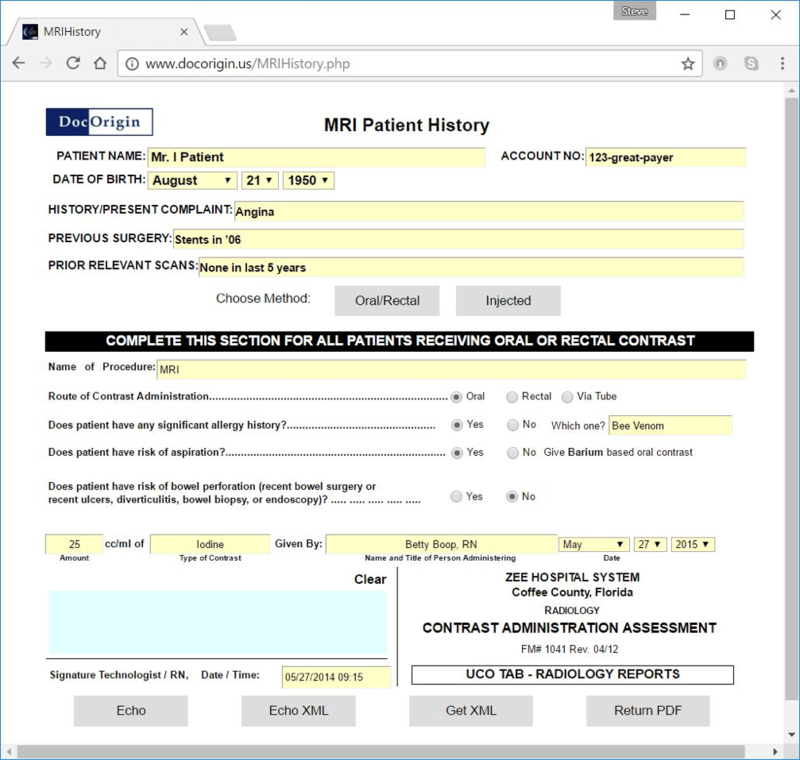 In our patient information example, the “Oral” button was selected, so the DocOrigin-designed form displays only the questions relevant to that particular contrast media delivery method. Then, based on selections being made by the user, the DocOrigin HTML or PDF form will maximize the screen real estate by displaying only the information relevant to each choice. Time is too valuable to be wasted reading text fields that are irrelevant. If you are not allergic to any medication, why waste your screen space displaying a list of common allergies? 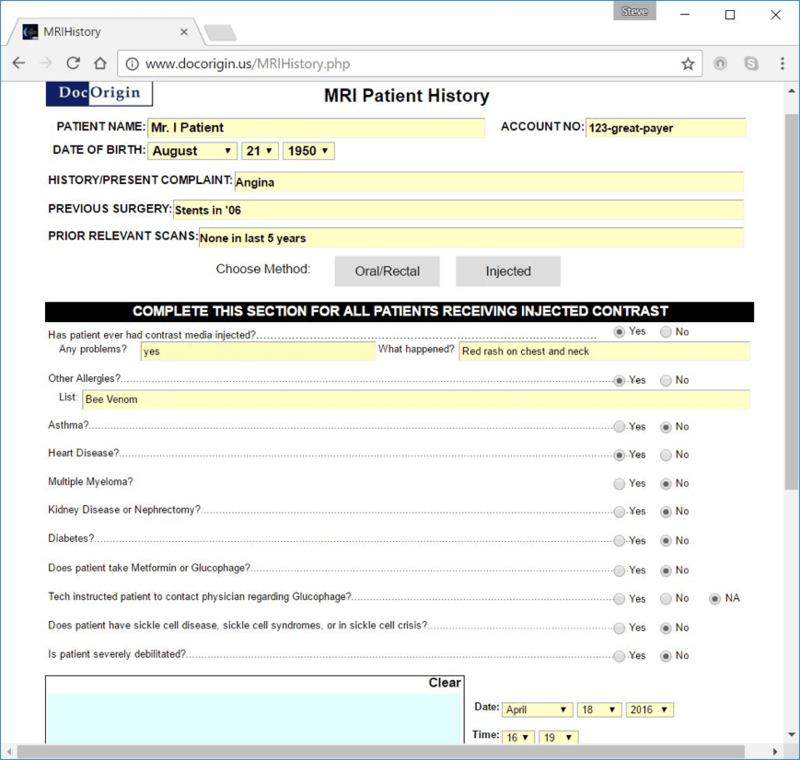 Selecting the Oral button in our medical form example displays only questions relevant to that procedure, at left. Alternatively, selection of the Injected button displays only questions relevant to that procedure, at right. Using the DocOrigin Design software, users can design static or extensively dynamic forms that maximize the real estate on the mobile device or computer. 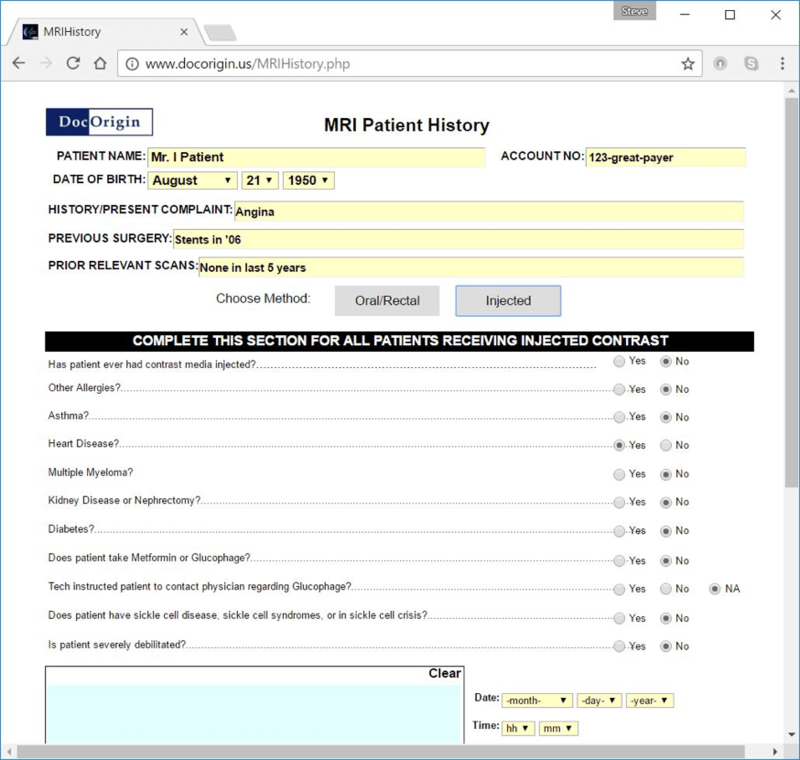 In our medical form example above, the patient selected the Injected button, triggering the display of questions relevant only to that procedure, and will expand dynamically for the collection of more data when necessary, according to the patient’s answers to the questions. In this example, the patient answered Yes to the questions concerning contrast media. The form then adjusted automatically to present two new questions, pertinent only to an affirmative answer to the original question. 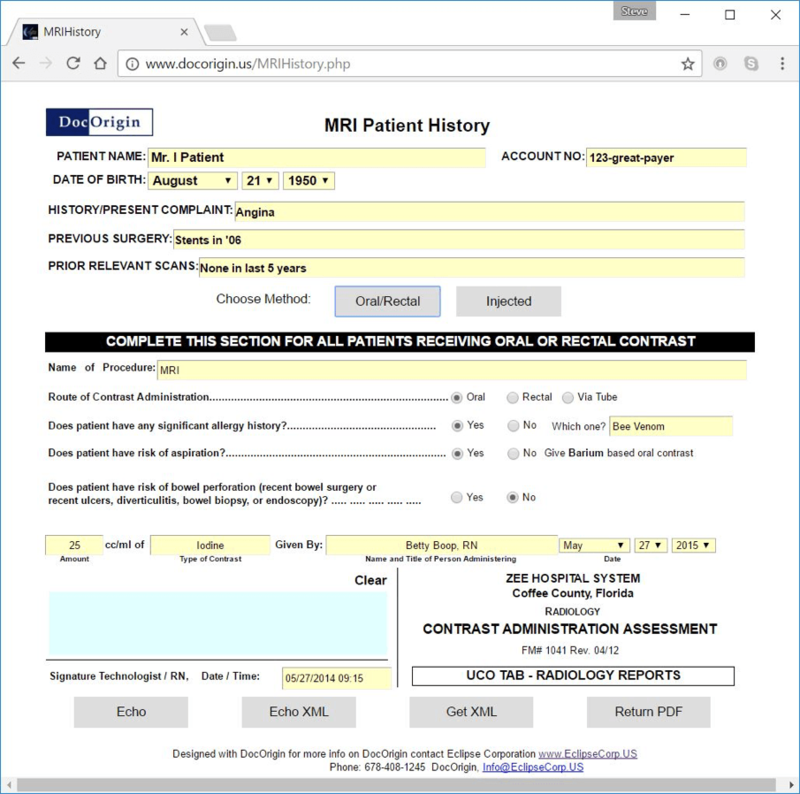 Likewise, an affirmative answer to the Other Allergies question triggers the display of a form field for the patient to list their allergens. Optionally, the form could also display a checkbox list of common allergies. 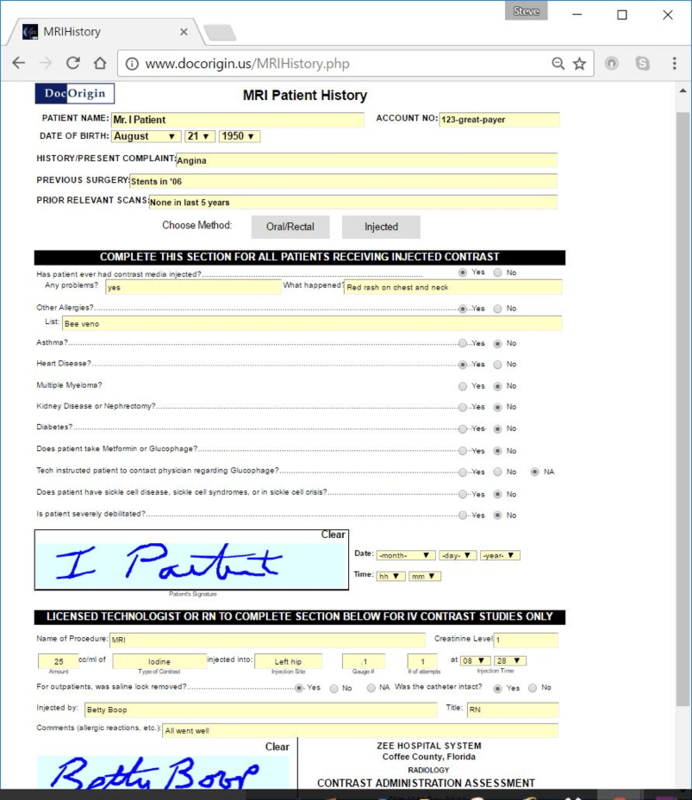 In this example, the patient has completed and signed the DocOrigin form and submitted it to the technologist, who must also sign. 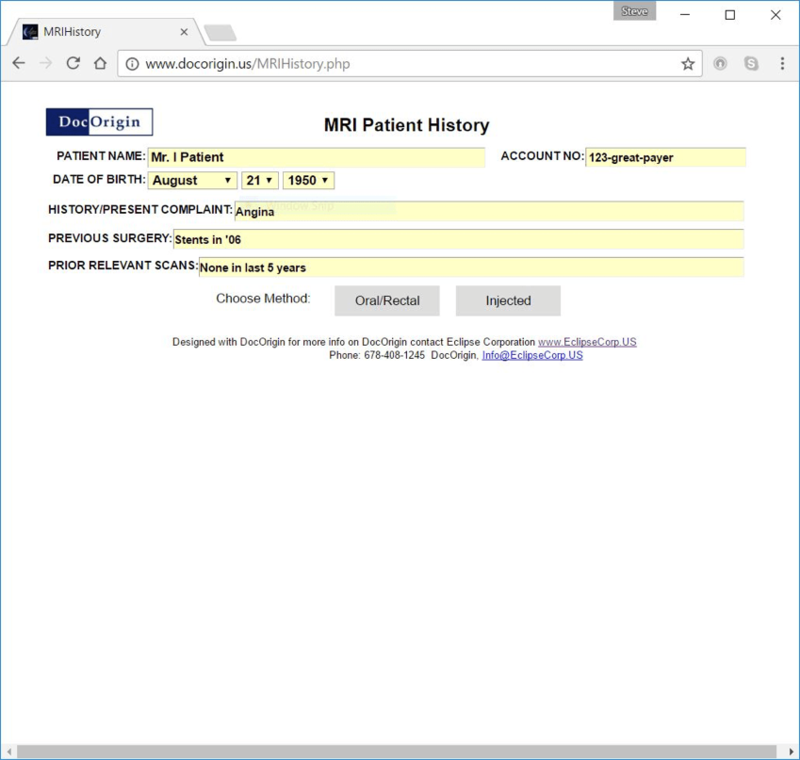 The collected data and signatures are then securely transmitted into the business software and a secure PDF/A can be pushed to archive and/or sent to patient’s online portal or email. Download our Dynamic Fillable Form Solution Brief to learn more about DocOrigin, and how we can help your company save time, resources and money! Check out samples of forms, labels and statements that were generated using DocOrigin.